Wassily Kandinsky, an accomplished impressionist painter and generally credited as the founder of modern art said that of all the art forms abstract art is the most difficult to perfect. So true! It looks easy until you actually try it. 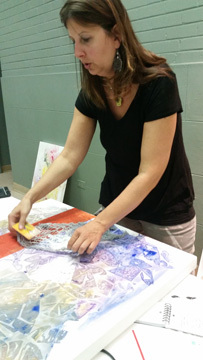 With a warm and friendly teaching style, abstract artist Jennifer Bobola spent the day with us sharing some of her techniques and philosophy. 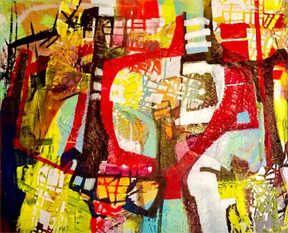 it's not hard to see why she is such a popular instructor and one of the rising stars of the Denver art world. The central theme of the workshop was to use all the techniques and materials that you can, but find a way to make the art "your own." Giving up one of summer's last warm sunny days to take part in this workshop proved to be well worth the sacrifice. You can view Jennifer's art at the Abend Gallery in Denver or online at www.abendgallery.com.